It is very easy to uninstall eg remove the ThisIsMyFile the file un-locker from your Windows 10 and 8.1 or other Windows Operating Systems! 1.) ... Uninstall the file un locker ThisIsMyFile. 2.) ... Program Parameters for ThisIsMyFile. 1.) Uninstall the file un locker ThisIsMyFile. Please uninstall via control panel and Program and Features! Read this: How to find installed program files in windows 10 (uninstall)? For portable use, please create or copy in ThisIsMyFile working directory the ThisIsMyFile.ini. (Image-1) Uninstall the File Unlocker ThisIsMyFile! 2.) Program Parameters for ThisIsMyFile. 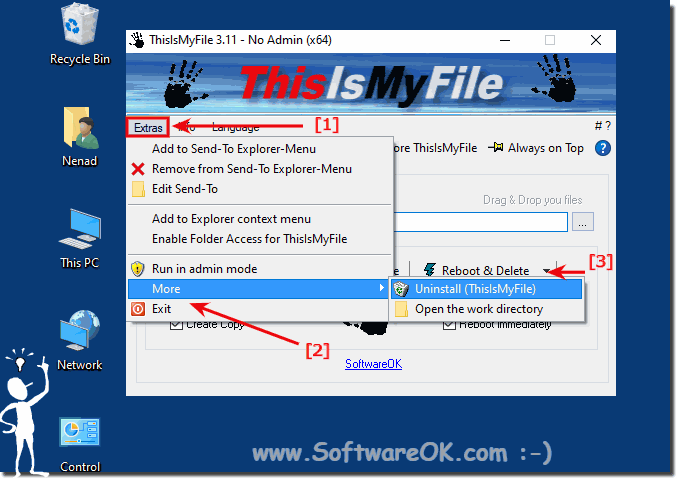 ThisIsMyFile - FAQ-1: How can I uninstall the File Unlocker ThisIsMyFile?